Open access Investigating Holocene human population history in North Asia using ancient mitogenomes, by Kılınç et al., Scientific Reports (2018) 8: 8969. 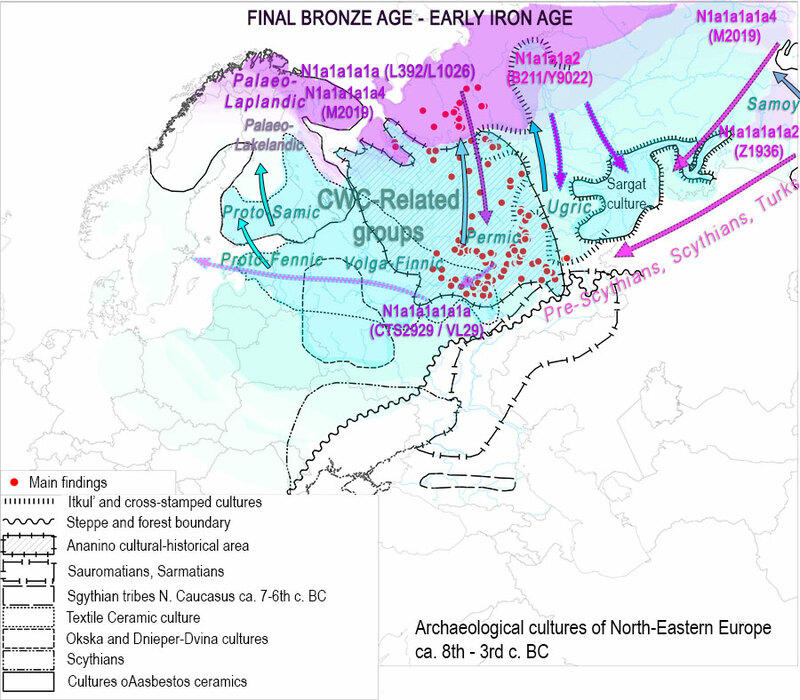 Archaeogenomic studies have largely elucidated human population history in West Eurasia during the Stone Age. However, despite being a broad geographical region of significant cultural and linguistic diversity, little is known about the population history in North Asia. We present complete mitochondrial genome sequences together with stable isotope data for 41 serially sampled ancient individuals from North Asia, dated between c.13,790 BP and c.1,380 BP extending from the Palaeolithic to the Iron Age. 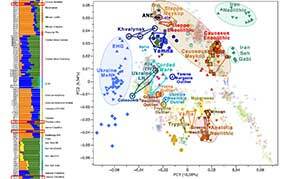 Analyses of mitochondrial DNA sequences and haplogroup data of these individuals revealed the highest genetic affinity to present-day North Asian populations of the same geographical region suggesting a possible long-term maternal genetic continuity in the region. We observed a decrease in genetic diversity over time and a reduction of maternal effective population size (Ne) approximately seven thousand years before present. Coalescent simulations were consistent with genetic continuity between present day individuals and individuals dating to 7,000 BP, 4,800 BP or 3,000 BP. Meanwhile, genetic differences observed between 7,000 BP and 3,000 BP as well as between 4,800 BP and 3,000 BP were inconsistent with genetic drift alone, suggesting gene flow into the region from distant gene pools or structure within the population. These results indicate that despite some level of continuity between ancient groups and present-day populations, the region exhibits a complex demographic history during the Holocene. 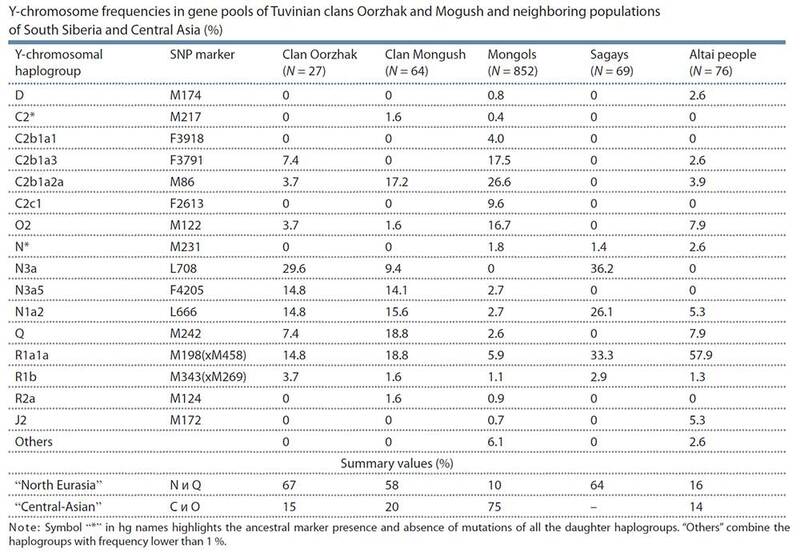 Relationship between ancient North Asians and other populations based on haplogroup frequencies. 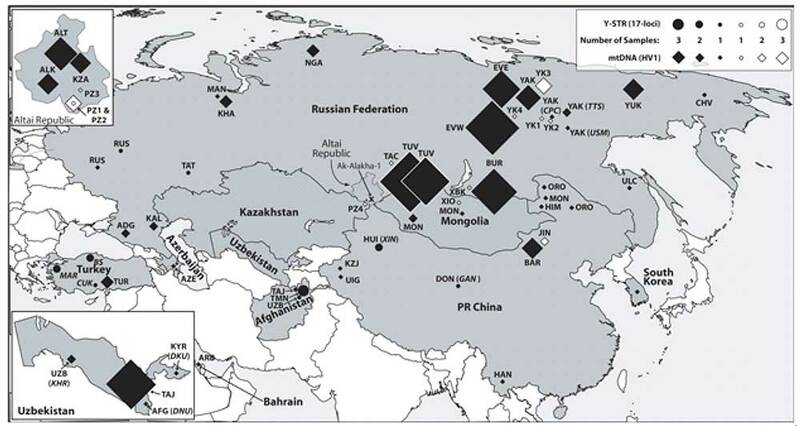 Ancient North Asians as a single group (SIB, n = 41) and as divided into three different regional groups including Cis-Baikal (CISB, n = 23), Trans-Baikal (TRAB, n = 7) and Yakutia (YAK, n = 9) or as divided into three temporal groups including Early (7,000 BP, n = 11), Middle (4800 BP, n = 16) and Late (3000 BP, n = 11). 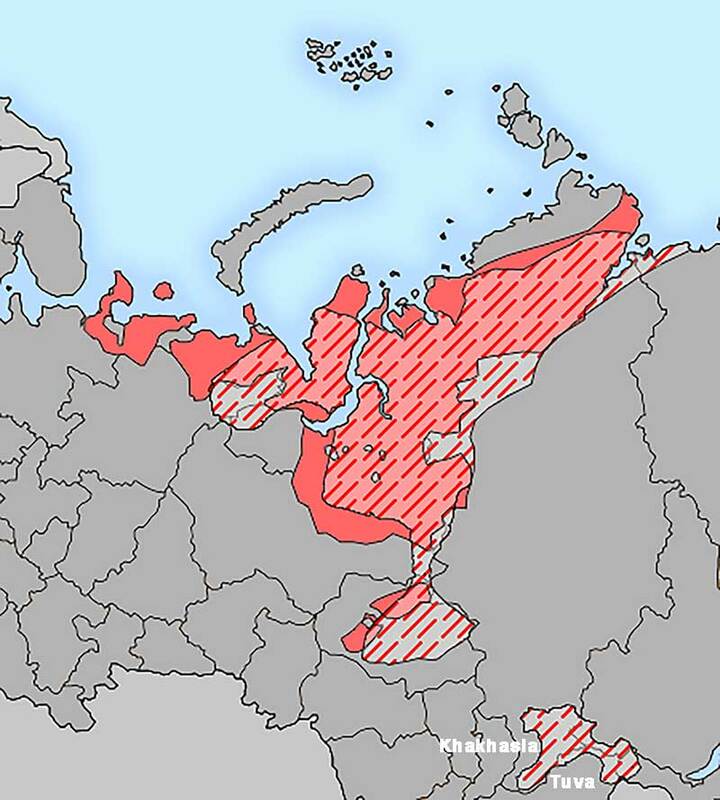 Two individuals from Krasnoyarsk and Blagoveshensk are not included in regional groups due to their distinct geographical locations. 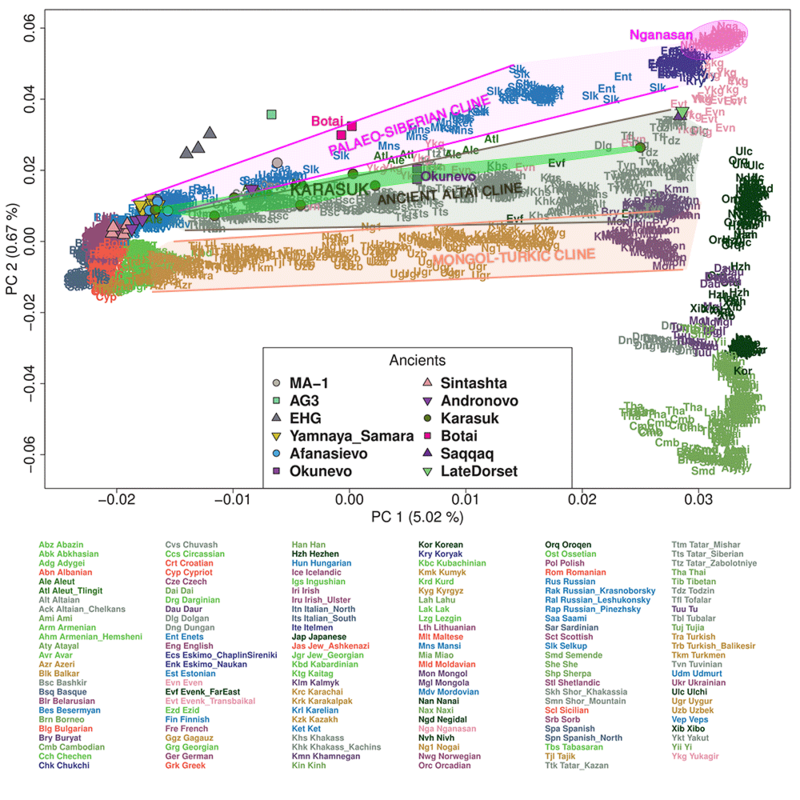 (a) Barplot showing haplogroup frequencies on a dataset of 1,780 individuals. PCA plot based on haplogroup frequencies calculated using (b) 291 individuals with full mitochondrial sequences. Ancient North Asians are included as a single population. (c) 1,780 individuals. 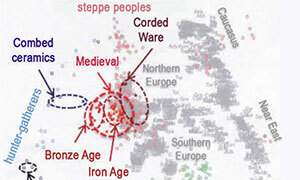 Ancient North Asians are included as three different regional groups in the analysis. See also Supplementary Tables S1, S4–S12 and Fig. S3a and b in Supplementary Information. 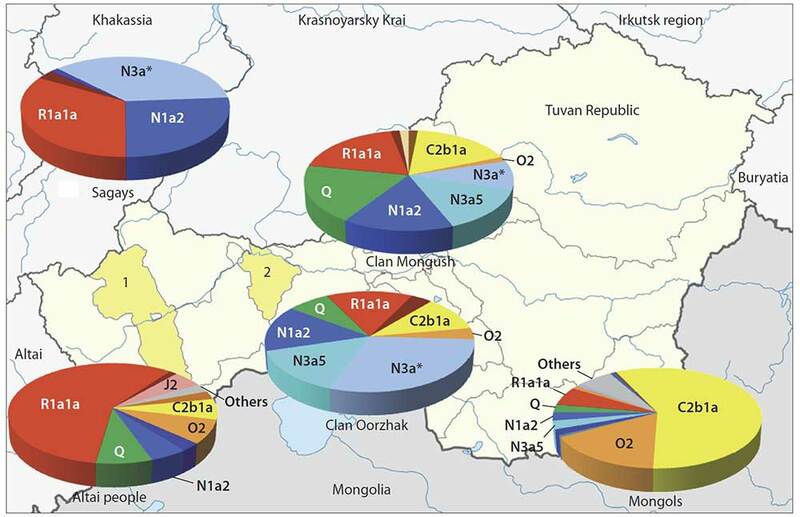 Although highly dependent on sample size and thus prone to generalization, haplotype sharing analysis between three spatial groups and other modern and ancient populations (Supplementary Table S15) revealed that the TRAB group shared most lineages with ancient Kazakh Altai (KA) and modern Nganasan (NGN)39,40,41,42. 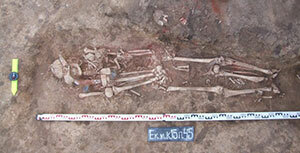 The CISB group shared most lineages with Tubalar39,42, KA43 and Early Bronze Age groups of Russia (BO)12, which might reflect the Siberian roots of BO, consistent with MDS based on Fst (Fig. 3b). The YAK group shared most lineages with the CISB, BO and Tubalar groups. 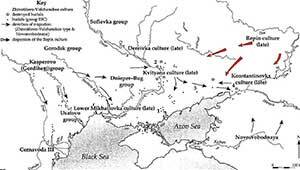 These results showed that despite being from different sides of the Lake Baikal, the CISB and YAK groups shared most lineages with the Tubalar and also both of them were to a certain degree affiliated to the BO of the Cis-Baikal region, thus, reflecting a shared common ancestry. Furthermore, the CISB and YAK groups share lineages supporting the hypothesis of a lasting continuity in this large geographical territory. However, the TRAB group may have different legacy with affinities to ancient Kazakh Altai and modern Nganasan groups (that, actually, may have relocated from the Trans-Baikal region in times post-dating our sample). Relationship between ancient North Asians and other ancient and present-day populations based on Slatkin’s linearized pairwise FST. MDS plot based on Slatkin’s linearized pairwise FST calculated using (a) full mitochondrial DNA sequences. (b) HVRI sequences. See also Fig. S3c and d in Supplementary Information, Supplementary Tables S13–S15. Two findings, however, were intriguing. One was the discovery of only weak support for a single regional population in comparisons between Early vs. Late as well as Middle vs. Late groups in the region. 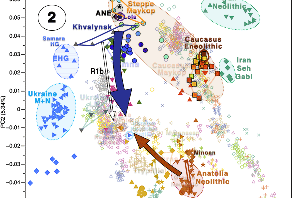 This may be explained by population structure, as the Late group comprised geographically very distant individuals, such as individuals from Krasnoyarsk Krai and Amur Oblast, not represented in the other diachronic groups (Table S9). 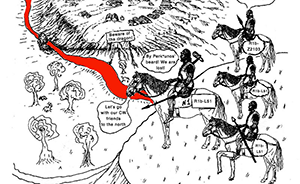 Another explanation for rejecting the null hypothesis of continuity between the Middle and Late (4,800–3,000 BP) groups might be due to an interruption and the arrival of pastoralists at the beginning of the Iron Age between 3,670 to 2,760 BP as suggested by the archaeological record32. 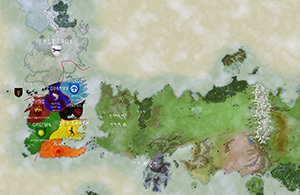 Thus, the introduction of the new lifeways, technologies and material culture expressions might also here be associated to an increased mobility into the area. 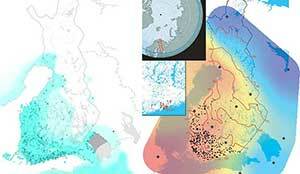 The second point was the estimated reduction in maternal effective population size and haplotype diversity around 7,000 BP. 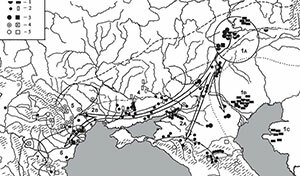 Intriguingly, climate modelling and radiocarbon dating studies53 suggest that climatic change and a collapse of the riverine ecosystems might have affected the human populations in Cis Baikal between 7,000–6,000 BP in line with our results. 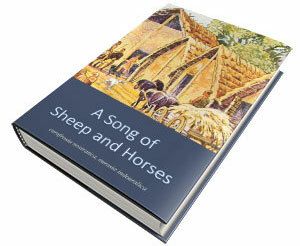 This finding was further supported by archaeological studies pointing to a possible hiatus38,54,55. Although our results provide a first glimpse into population structure and diversity in North Asia during the Holocene which link to trend in the archaeological record, complete genome sequences will provide a higher resolution of more complex demographic events in the region. New paper (behind paywall) Reconstructing the genetic history of late Neanderthals, by Mateja Hajdinjak, Qiaomei Fu, Alexander Hübner, et al. Nature (2018). Although it has previously been shown that Neanderthals contributed DNA to modern humans, not much is known about the genetic diversity of Neanderthals or the relationship between late Neanderthal populations at the time at which their last interactions with early modern humans occurred and before they eventually disappeared. Our ability to retrieve DNA from a larger number of Neanderthal individuals has been limited by poor preservation of endogenous DNA and contamination of Neanderthal skeletal remains by large amounts of microbial and present-day human DNA. Here we use hypochlorite treatment6 of as little as 9 mg of bone or tooth powder to generate between 1- and 2.7-fold genomic coverage of five Neanderthals who lived around 39,000 to 47,000 years ago (that is, late Neanderthals), thereby doubling the number of Neanderthals for which genome sequences are available. 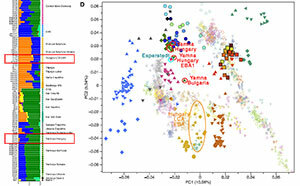 Genetic similarity among late Neanderthals is well predicted by their geographical location, and comparison to the genome of an older Neanderthal from the Caucasus indicates that a population turnover is likely to have occurred, either in the Caucasus or throughout Europe, towards the end of Neanderthal history. We find that the bulk of Neanderthal gene flow into early modern humans originated from one or more source populations that diverged from the Neanderthals that were studied here at least 70,000 years ago, but after they split from a previously sequenced Neanderthal from Siberia around 150,000 years ago. Although four of the Neanderthals studied here post-date the putative arrival of early modern humans into Europe, we do not detect any recent gene flow from early modern humans in their ancestry. Phylogenetic relationships of late Neanderthals. a, Bayesian phylogenetic tree of mitochondrial genomes of 23 Neanderthals, 3 Denisovans, 64 modern humans and a hominin from Sima de los Huesos. The posterior probabilities for the branches are shown. b, Neighbour-joining tree of Y chromosome sequences of Mezmaiskaya 2, Spy 94a, 175 present-day humans21 and two present-day humans carrying the A00 haplogroup30. The number of substitutions is shown above the branches. 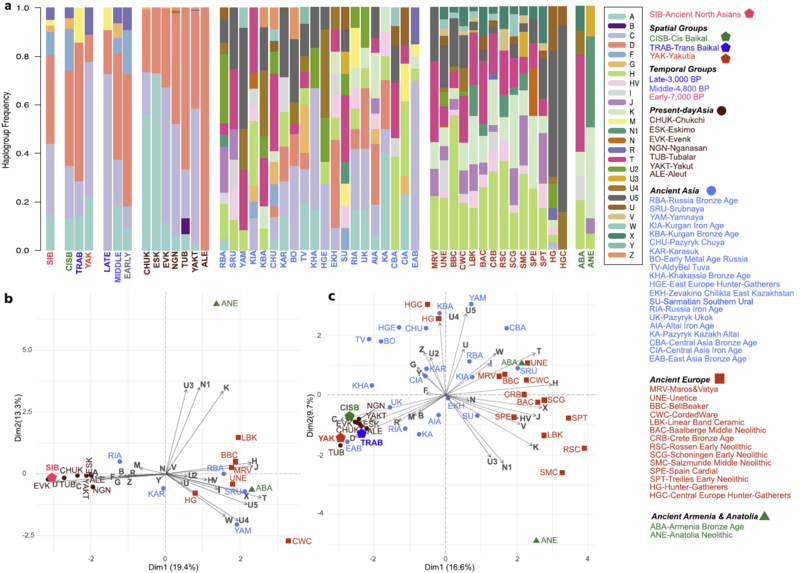 c, Neighbour-joining tree of nuclear genomes based on autosomal transversions among late Neanderthals, Vindija 33.19, Mezmaiskaya 1, Altai Neanderthal, Denisovan and 12 present-day humans. Bootstrap support values after 1,000 replications are shown. (…) Mezmaiskaya 2 shared more derived alleles with the other late Neanderthals than with Mezmaiskaya 1 (− 2.13 ≤ Z ≤ − 9.56; Supplementary Information 9), suggesting that there was a population turnover towards the end of Neanderthal history. This turnover may have been the result of a population related to western Neanderthals replacing earlier Neanderthals in the Caucasus, or the replacement of Neanderthals in western Europe by a population related to Mezmaiskaya 2. The timing of this turnover coincides with pronounced climatic fluctuations during Marine Isotope Stage 3 between 60 and 24 ka, when extreme cold periods in northern Europe may have triggered the local extinction of Neanderthal populations and subsequent re-colonization from refugia in southern Europe or western Asia. (…) the majority of gene flow into early modern humans appears to have originated from one or more Neanderthal populations that diverged from other late Neanderthals after their split from the Altai Neanderthal about 150 ka, but before the split from Mezmaiskaya 1 at least 90 ka. Owing to the scarcity of overlapping genetic data from Oase 1, whose genome revealed an unusually high percentage of Neanderthal ancestry11, we were unable to resolve whether one of these late Neanderthals was significantly closer than others to the introgressing Neanderthal in Oase 1. Open access paper Analysis of Human Sequence Data Reveals Two Pulses of Archaic Denisovan Admixture, by Sharon L. Browning, Brian L. Browning, Zhou, Tucci, & Akey, Cell (2018). Anatomically modern humans interbred with Neanderthals and with a related archaic population known as Denisovans. Genomes of several Neanderthals and one Denisovan have been sequenced, and these reference genomes have been used to detect introgressed genetic material in present-day human genomes. Segments of introgression also can be detected without use of reference genomes, and doing so can be advantageous for finding introgressed segments that are less closely related to the sequenced archaic genomes. We apply a new reference-free method for detecting archaic introgression to 5,639 whole-genome sequences from Eurasia and Oceania. 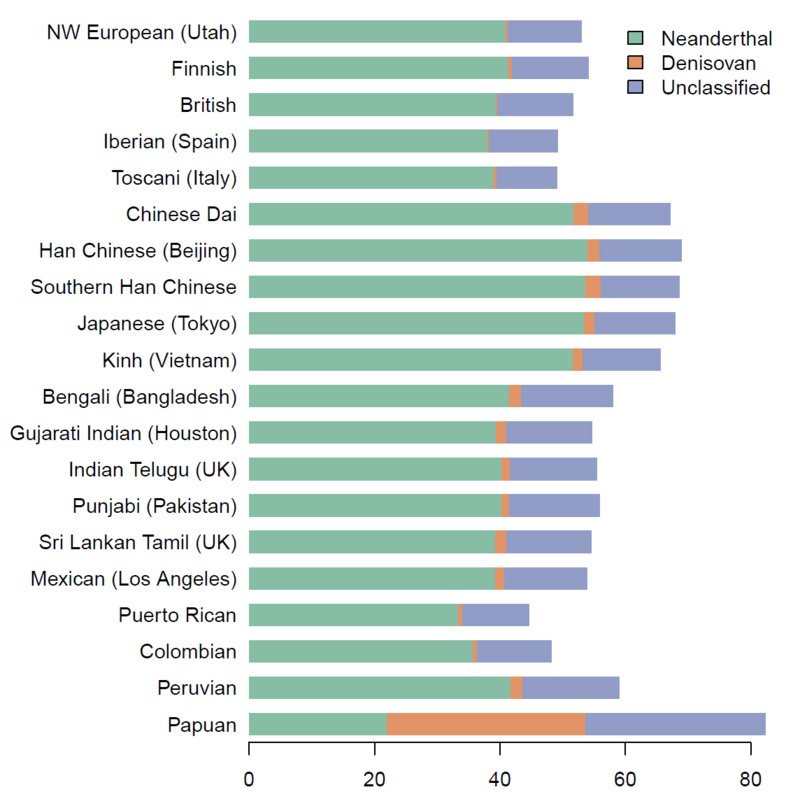 We find Denisovan ancestry in populations from East and South Asia and Papuans. 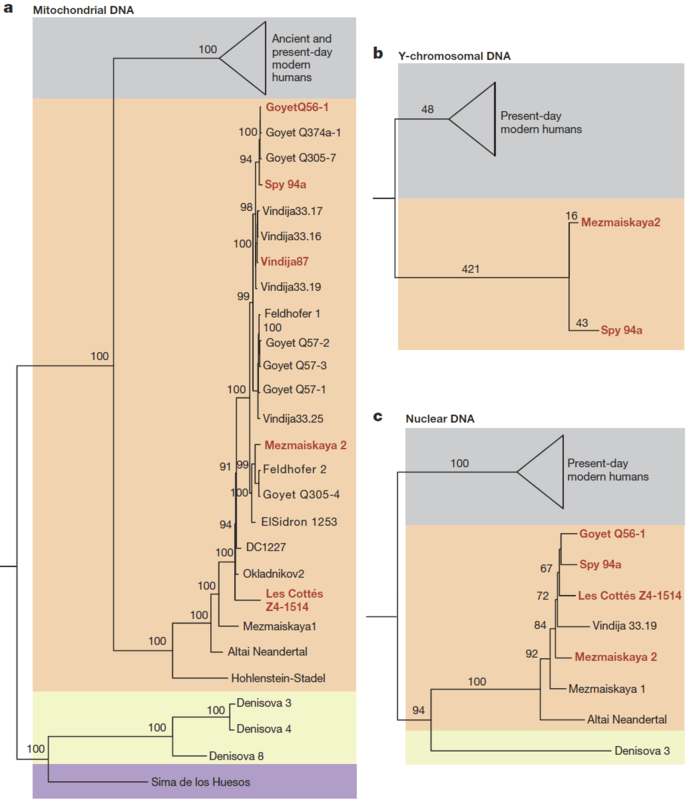 Denisovan ancestry comprises two components with differing similarity to the sequenced Altai Denisovan individual. 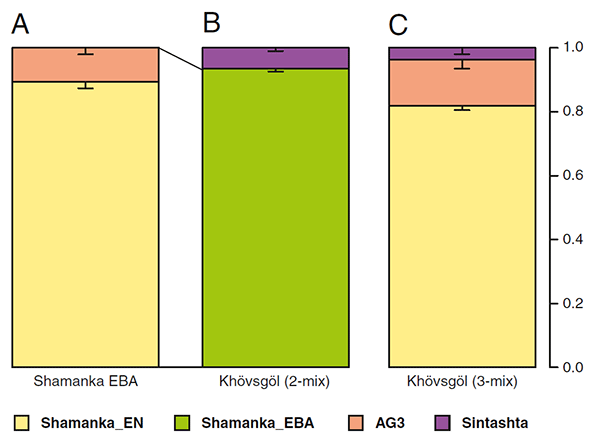 This indicates that at least two distinct instances of Denisovan admixture into modern humans occurred, involving Denisovan populations that had different levels of relatedness to the sequenced Altai Denisovan. Featured image, from the article: Contour Density Plots of Match Proportion of Introgressed Segments to the Altai Neanderthal and Altai Denisovan Genomes. A new paper has appeared at BioRxiv, The Genomic Health Of Ancient Hominins (2017) by Berence, Cooper and Lachance. Important results are available at: http://popgen.gatech.edu/ancient-health/. Ancient sample selection and genomic quality: only 147 ancient genomes were included, from 449 available, with a conventional cut made at 50% of the focal 3180 disease-associated loci. 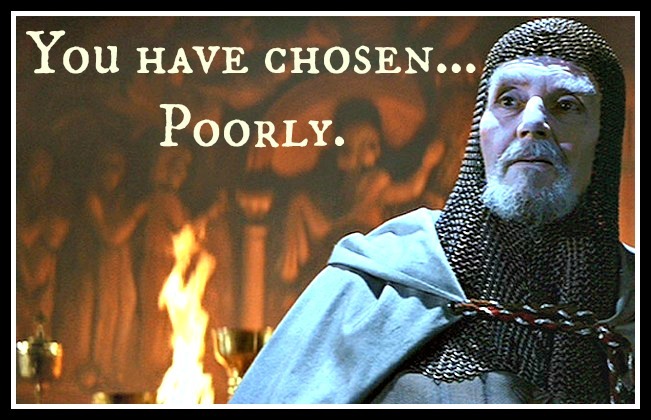 These samples did not include the same loci. All this can affect whether an individual has high or low GRS (a relationship was found between GRS percentiles and sequencing coverage for ancient samples). Phase 3 of the 1000 Genomes Project was used. However, many disease alleles that segregated in the past remain undiscovered – therefore, GRS for ancient individuals should be considered to be underestimated. Multiple comparisons with all data available, using multiple groups, in the small sample selected: comparisons were made between standardized GRS percentile, sample age (i.e. estimated date), mode of subsistance, and geographic location. 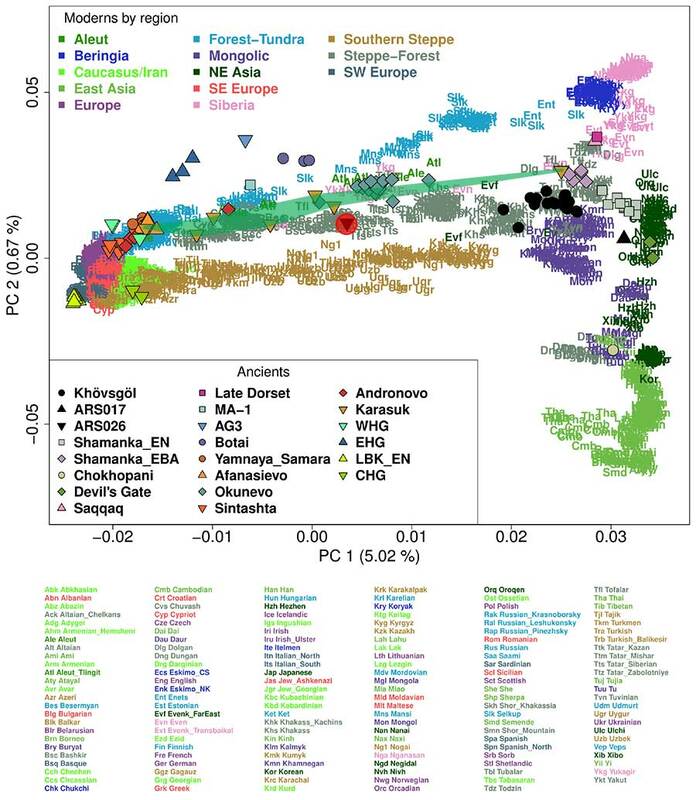 Northern ancient individuals (using latitude values) show healthier genomes: but, most ancient individuals are from Eurasia, and samples are heterogeneous. Agriculturalists show a higher genetic risk for dental/periodontal diseases than hunger-gatherers and pastoralists. However, this disease has the smallest number of risk loci (k = 40), so risk in older samples might be underestimated, and pastoralists are the more recent agriculturalist population (most used agriculture as a complementary diet), so it is only natural that selection had an impact over time in this aspect. Pastoralists have the smallest sample size (19 samples) and geographic range, so conclusions about this group are still less trustworthy. 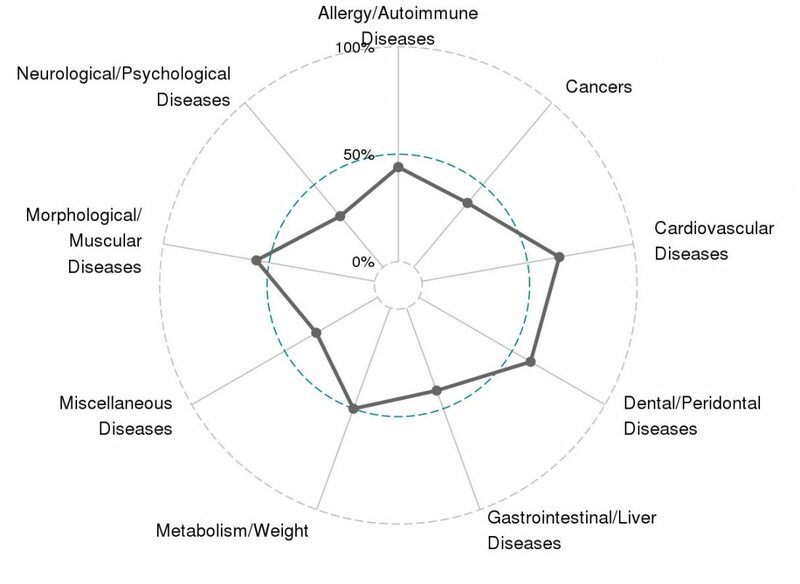 Genetic risk percentile ≠ Genomic health ≠ phenotypic health (not deterministic), and also disease-associated alleles in modern populations ≠ same effects in past environments. To sum up, an interesting approach to studying genomic health with the scarce data available, but too many comparisons, with too many hypotheses being tested, which remind to a brute-force attack on data that can therefore yield statistically significant results anytime, anywhere.